The industrial metals and minerals market has had a tough year or two, but what about its long-term growth? Much depends on China. Industrial metals and minerals lie at the heart of the global construction and manufacturing industries. For that reason alone, it's always going to be a cyclical industry -- investment jargon for an industry whose prospects are tied to economic growth. The key question investors need to think about now, with regard the current cycle, is: Where is China's demand for industrial metals and minerals heading? Will it be sufficient to create marginal demand to take industrial metals and minerals prices higher? If you're an investor in one of the large diversified miners, such as Vale (NYSE:VALE), Rio Tinto (NYSE:RIO), or BHP Billiton (NYSE:BHP), or metals producers such as Alcoa (NYSE:AA) (aluminum) or Nucor (NYSE:NUE) (steel), then the question will be of crucial importance. I'll return to it later, but first, a closer look at the industry. What is the industrial metals and minerals industry? In a nutshell, the industry includes any mineral or material that's used for construction and industrial purposes. As such, it excludes those used for energy purposes. Examples of industrial minerals include asphalt, silica, gypsum, and potash, along with less obvious industrial minerals such as marble and diamond. Some important industrial metals include copper, steel, aluminum, lead, and zinc. In addition, rare-earth metals -- metals with unique properties that are increasingly being used in the electronics industry -- make up a further subset of the metals market. Rio Tinto Copper Mine. Source: Rio Tinto. Strictly speaking, coal isn't an industrial mineral, because it's mainly used for fuel and as part of the steelmaking process. A similar argument applies to iron ore. However, both are subject to many of the same end-demand drivers, so you could consider them as being in tandem with industrial metals and minerals. How big is the industrial metals and minerals industry? According to a report from the International Council on Mining and Metals, the global metal and mining industry grew from $214 billion in 2000, to $644 billion in 2010. It's this kind of growth that encourages many to believe in a so-called commodity supercycle, the idea being that increasing urbanization within emerging markets will lead to a huge increase in fixed asset investment (specifically housing, construction, and infrastructural activity) that would create a long-term boom in commodity demand. How does the industrial metals and minerals industry work? Loosely speaking, there are four kinds of companies in the industry. The most obvious are the large-scale miners such as Rio Tinto, Vale, or BHP Billiton, whose broad-based exposure makes them de facto plays on the mining and energy industry on the whole. The second group are companies with a heavy exposure to a metal or mineral, such as Southern Copper Co. (NYSE:SCCO) with copper. The third are the niche market players such as rare-earth miners, and the fourth are the metals producers such as Alcoa or Nucor, which tend to focus on one particular metal. What are the drivers of the industrial metals and minerals industry? According to a KPMG report, China makes up 45% of global metals demand, and if the commodity supercycle theory has credibility, then China's demand outlook is critical to the industry. The problem for the theory's advocates is that evidence in the past few years has created some room for significant doubt. 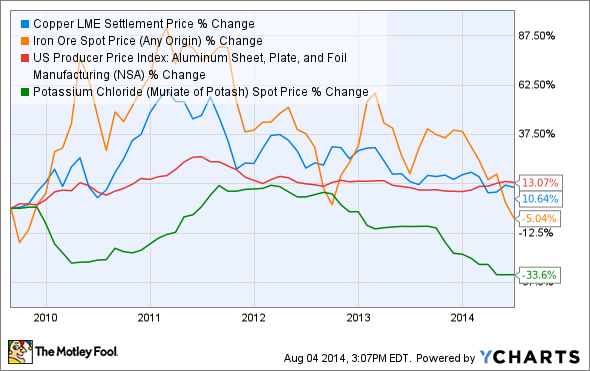 A chart of the key metals and minerals prices reveals the extent of the declines in the past two years. Copper LME Settlement Price data by YCharts. While much of the blame lies with ongoing slow growth in the global recovery and the slowing of growth expectations in China, there is an added factor. Specifically, China's massive $586 billion stimulus investment in 2008 led to a 30.5% increase in fixed-asset investment in 2009 and included significant expansion in steel and aluminum building capacity. The result is that China appears to now have overcapacity in these industries, a fact made worse by the slowing economy. Diehard believers in the supercycle theory will see this as a temporary slowdown in China's long-term demand, but China skeptics would question its ability to return to double-digit GDP growth anyway. The answer to this question will shape the long-term prospects of the industrial metals and minerals industry, and give clues as to whether it's the right long-term investment for you.